A few years back, Mastercard created and launched a city-centric series of special events - Priceless Cities giving any Mastercard holder (as long as they are signed up to the program) first-come access to invitation-only, once-in-a-lifetime events curated to their city of choice . . . in other words, behind-the-scenes at performances, private museum visits, Michelin-star dinners, et cetera*. With more than 40 cities on the list, it's easy to predict the line up: stateside it's New York, Los Angeles, Miami, San Francisco and more, and around the globe it's incredible metropolises like Cusco, Bogota, Mexico City, Sydney, Moscow, Paris, Munich and Rome. Rome's inclusion comes as no surprise, because it's Rome, the best city in the world, and by its very definition, "priceless". It was about time I popped into an event, and the timing was perfect. Lately, the Professor and I have talked ad infinitum about how we are in dire need of a change of scenery and a cocktail. We've come to the academic conclusion that we've exhausted our time at our local haunts so much that even they probably would love for us to get out as well. 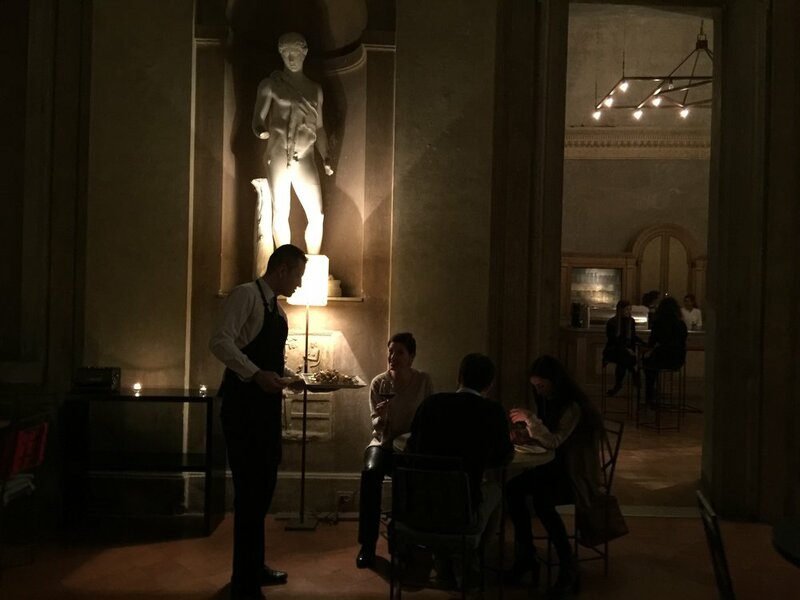 A visit to Villa Medici has long been on my list, especially since the villa rebooted its basic bar into Parisian cafe/bistrot Colbert, so when Colbert appeared on Priceless Cities' list, I knew it was fate, or better yet, a great excuse to set foot in the bastion of Frenchyness. Villa Medici is my great escape- an incredible 16 villa above Piazza di Spagna that, thanks to Napoleon, lets me live out my Franco-fantasies. The villa is a masterpiece, built in 1564 and eventually acquired by Cardinal Ferdinand de' Medici in 1576. Its hallowed ceilings have Zucchi frescoes, the exterior back facade has bas relief copies of the Ara Pacis, there are fountains, a garden maze, a hidden studiolo, just to name a bit of its decor. In 1803, Napoleon moved the French Academy to the Mannerist villa, and ever since the Academy hosts artists in residence and curates a progressive/agressive program of performances, concerts, film screenings, and exhibitions year round.... not to mention public visits to the historical villa and gardens. It. Is. Magical. And so is the window seat at Colbert. Nope, our priceless evening was not about the Villa but about Colbert during its closed hours. Getting there was half the fun, we walked through the main entrance and up a marble staircase to one of the Villa's famous chiocciola -spiral staircase - to the southern wing. When we arrived, lights were low and it felt like that inky evening sky was rumbling through Colbert's halls- a beautiful space of high ceilings with faint tracings of frescoes, bare walls with an occasional reproduction of an ancient statue, and my window with a panoramic view of Rome from San Pietro to the Vittoriano. Aproned waiters brought us amuse-bouche and aperitivi, while the Professor took over a salumi buffet by Fiorucci. We took advantage of the low lighting and table, and talked to no one but ourselves. . . the perfect evening out. For more about Priceless Cities in Rome and Italy, take a look here. * Most events require advance reservation and, from what I've seen, have costs as low as 10 euro to events for Platinum Cardholder only, so even I have no concept of what that value would be.